If you’re struggling to organize a craft closet to corral all of your craft supplies, these tips should help. 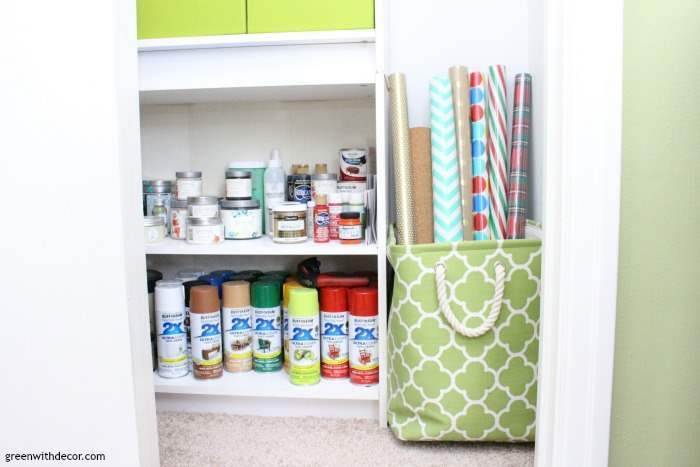 Better yet, these ideas are all about organizing a craft closet on a budget! It’s week 5 of the One Room Challenge (ORC), which means room reveal week is next week. Wow that snuck up fast. Six weeks seemed like such a long time to get the office into shape! I am STILL painting the bookshelf, but we’re getting there. But good news, I organized the craft closet this week, and it’s making me so happy. Whenever I start stressing about all the work I still have to do to make the room look presentable by next week, I just open the closet for a second and smile at all the organization. It is SO nice to have all of my craft supplies in one place instead of running around the house trying to remember the last place I used the painter’s tape or stencils. The best part of this little organizing project is that I didn’t spend a dime. This may not look like a perfect Pinterest-worthy organized closet (but hey, feel free to pin it! 🙂 ), because all the containers aren’t perfectly fit for the shelves, the closet isn’t all set up with a customized storage system, and there aren’t little labels on everything, but I’m pretty happy with it! 1. Use storage options you already have. Okay, duh. But seriously, use whatever containers and/or storage units you have around the house. I had a bunch of these green bins hanging around in different places around the house. I swapped out a few of these with other random containers (no idea why we have so many of those clear plastic bins but they sure come in handy!) so I could use four of the same green bins to organize the craft closet. My parents had a few of these bookshelves sitting in their basement. As much as I’d love a customized organized closet, stacking two of these free bookshelves on top of each other works just fine. 2. Group your supplies by category. Other smaller supplies: scissors, tape, hole punch, etc. I’m so excited to have everything from different categories grouped together. Sometimes I buy something for a project (like a roll of cork or twine) and only need a small portion of it. I hate it when I forget what craft supplies I have and end up with two of something. 3. Use storage containers you can easily see into. I realize I just said to use bins you already have. I’m still standing by that. But if you’re like me, you probably have a random assortment of bins around the house that you can use in the closet. Go with the clear ones or leave the tops off the colored ones (like I did here) so you can easily glance into each container and get whatever it is you’re looking for. 4. The closet doesn’t have to be stuffed full. While I have a lot of craft supplies, I don’t actually have enough to fill the whole closet. I know, I was surprised, too. Instead of shoving other random stuff in the closet to fill it, I just left it as a craft closet. Sometimes it’s easy to throw stuff in a closet to get it out of sight, but I’ve been on an organizing spree this year (going through the whole house is taking me months! I need breaks! ), and I’m really trying to have storage/closets dedicated to just one or two purposes. Hopefully these organization tips help you without making you feel like you have to run out and buy a bunch of matching bins and an expensive label maker to get a nice looking organized closet. We all have other things to spend our money on! Doesn’t it make you happy?! The room is coming together! 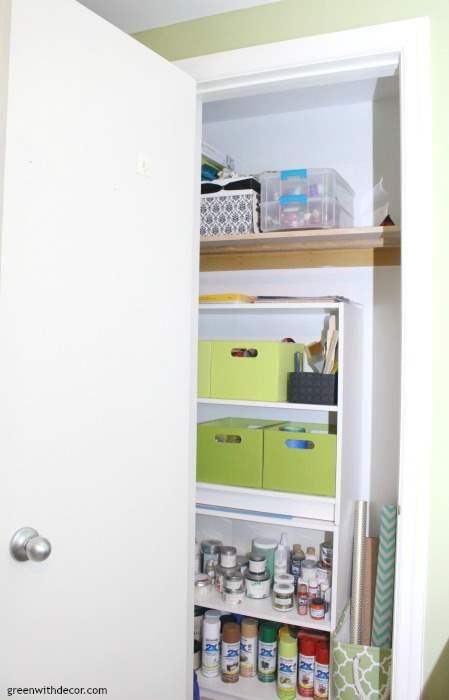 Meg – we are super jealous of your beautifully organized craft closet. We are always running around in search of our supplies that are stored in odd places – in two separate households 🙂 Can’t wait for your room reveal next week! SO jealous of your organized craft closet! I am definitely that person running around looking for a random craft supply I know I have, only to end up buying it again because I just can’t find it! Can’t wait to see your full reveal! Haha, hopefully I can stop doing that now that I have the closet organized! Haha yes, it was fun to see all the craft supplies together in one place! I need to get my craft room back into an organized manor! Thanks for motivating! Just another thing to add to my checklist before baby arrives! 🙂 I’m looking forward to seeing your final reveal next week! 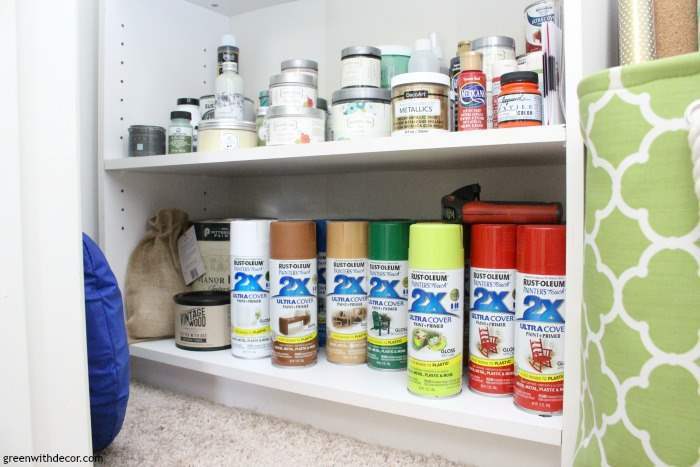 So organized–I need to find a way to organizes my craft paint. It’s overwhelming!! You have been a busy bee, I love fixing up closets, I am always re-doing my closets, because they don’t stay organized very long. thanks for the tips… I am so excited to see the finale. Thanks, Maria! It’s so great to have organized closets, isn’t it?! You have a lot of spray paint, Meg! I bet it feels so great to have that craft closet all organized. I can’t wait to see the full reveal of your home office! Good luck with all the last details! Haha, I do have a bit of a spray paint obsession. Thanks, Tee! An organized space just make everything better! Looking forward to the reveal of your space! Good idea on getting all the craft supplies in one spot. Thanks for the tips. Can’t wait to see your office space reveal next week. It looks great, Meg! I definitely need to get all my similar things in one spot. I think I have supplies in every room of the house right now!! Looking forward to your big reveal! Thanks, Rachael! It’s nice to have everything in one spot! Meg, I love your craft closet. Isn’t it so fun to see all the supplies in one place. I especially like how you try to use storage bins and things you already had around the house. Just goes to show being neat doesn’t have to be expensive! Happy crafting! Thanks, Carrie! It’s so nice to have everything organized in one closet!